Lego instructions - instructions on how to build pretty much everything ever from Legos. I don't have a huge stash of Legos, but I bet someone out there does. Geek Painted Nail Designs - I linked these on Facebook too, but they are so damn cool that you should look again. I'm not even capable of painting my fingernails a solid color, so I can't imagine the work these took or even how. It doesn't quite look airbrushed, but I could be wrong. Nail polish is not my area of knowledge strength. Behind the scenes of Game On - I'm sure most of you that are fans of the webseries The Guild or Felicia Day saw the latest music video Game On. Greg Aronowitz, prop builder, FX, etc, put together this great behind the scenes post on the video. See how the props were made and learn just why he has a prop elephant on hand. Wookiee the Chew - If you haven't seen the adorable Wookiee the Chew illustrations from James Hance yet, stop reading this post and go look. Chewbacca as Winnie the Pooh, R2D2 as Piglet - your heart will melt from cute. Geek cross stitch - You know you've always wanted to cross stitch Donkey Kong or the Mac command key. 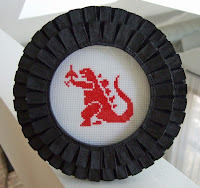 Geeky crafts say love like very few other things do. This Etsy seller has lots of options! Oh man, I am going to have to get back into cross-stitching! Those patterns are great. The nails are great too, but science and nailpolish tend not to mix much. Those patterns really made me want to go buy some embroidery floss! Thank you for sharing this information. The information was very helpful for me and saved a lot of my time. Bookmarked your website for future visit. Those models are great. Nails are good too. Sparkly or Burning - Which Kind of Vampire Is it?